Starting with mana base, I would cut any land entering tapped as the only way it enters. You are giving your opponent a Time Walk every time they come into play because it puts you a turn behind. They either should just be basic lands or upgrades, the big ones being City of Brass , Mana Confluence , and Forbidden Orchard . These lands far outweigh things like Bojuka Bog or Murmuring Bosk or Temple of Plenty . Also would cut Razorverge Thicket , Canopy Vista , Fortified Village and High Market . The first three are too conditional and High Market is colorless with no immediate benefit. I would play the pain lands before these lands as they don’t enter tapped and still give you your colors and I would play the fetchlands before the painlands. Keep in mind you can play up too nine fetchlands because they don’t have any color symbols on them. Second, upgrade the tutor package. Vampiric Tutor and Demonic Tutor are the best black tutors in the format, and the reason to be in black. I would consider them higher priority than fast mana rocks. The cuts I would make are Apprentice Necromancer Damnation Day of Judgment Bloodthrone Vampire Qasali Pridemage Altar of Dementia Ashnod's Altar Lotleth Troll Life from the Loam Greater Good and Farseek The sac outlets only come out when you combo, so having excess is deadweight. The board wipes aren’t doing anything to stop fast combo, so they can be cut. The necromancer and pridemage are value, but not enough. I would rather play Assassin's Trophy and Abrupt Decay over those two. Card suggestions Stony Silence Null Rod Abrupt Decay Assassin's Trophy Birthing Pod Nature's Claim Nature's Lore Survival of the Fittest Demonic Tutor Vampiric Tutor Aura Shards Leyline of the Void , Containment Priest and Grafdigger's Cage . If you can’t play fast mana, neither should your opponents. The first two are MUST INCLUDES and the tutors are HIGH PRIORITY. Nature's Lore is a strict upgrade over Farseek . The last three are graveyard hate that hates out the two decks mentioned. I know that you are thinking “but those last two hate out my deck as well”. That is the wrong way to look at them. The first question you should ask is “are the two decks I’m losing too faster than me?” The answer is yes, they are. After that, the next question should be “can I be faster than them?” The answer is no, you can’t be faster than them. Without cards like Gaea's Cradle and Mana Crypt and Mox Diamond and Survival of the Fittest and Demonic Tutor you will never be faster. Even with these cards, this strategy is considered to be slower than the two decks mentioned. Therefore, you have to slow them down at all costs, even if it means you won’t be winning anytime soon. I would say that the hate pieces are MUST INCLUDES. I would cut Hushwing Gryff and Gaddock Teeg as these cards are not helping you fight your meta. The last bit of advice is that you are playing Stax pieces and are playing a Stax deck. The deck needs to fight what you are playing against. Anything that does not do that is unhelpful at best and a game loss at most. Sure, you are playing to a combo finish, but there are multiple turns before that game winning combo, and every card in your opening hand has to slow down your opponent or speed you up. If they are not doing that, they should be cut. Anyhow, this is just my opinion. Hope this helps. Good luck. Bojuka Bog : A must include in any black commander deck. Boneknitter : Utility, simple as that. Corpse Harvester : Out with the old, in with the new... and a swamp! Cryptbreaker : So much value in such a small package. Token generating, card draw, good in the early and late game... what is not to love about this card! Death Baron : A zombie lord with some extra punch Sure he doesn't get deathtouch himself, but all those 2/2 tokens that are now 3/3 deathtouch. Dread Summons : Ever seen those zombie movies with that big hoard that just keeps coming... that's this card. Gives you a bunch of tokens, and recursion bait for your commander. Endless Ranks of the Dead : Card title kind of says it all for this one. Obviously not the best in metas with wrath effects coming down every turn, but shines like a copper penny otherwise. Grave Titan : Why this thing isn't a zombie I will never know. 6/6 for 6, deathtouch, and brings two friends with it AND when it attacks. Graveborn Muse : Card draw based on zombies, who is also a zombie! Infernal Caretaker : Mass recursion, either play them out, or discard them back for more effects. Liliana, Death's Majesty : Just an all around strong zombie planeswalker. Liliana's Mastery : Zombies + an anthem that won't be a big target for removal. Lord of the Undead : A low to the ground zombie lord with recursion on a stick. Noxious Ghoul : Sweeps out low toughness cards for things you're already doing. Just great value. Relentless Dead : A great early drop, and late game it serves as a sac target + recursion. Shepherd of Rot : Yes it hits you, but this can be such a major threat. Undead Warchief : Cheaper zombies, and bigger zombies. All in one convenient package. Awaken the Erstwhile : Disruption, plain and simple. Sure it hurts your hand too, but you are the one with all the zombie based anthems. Victim of Night : Doomblade 2.0, but hits black creatures. 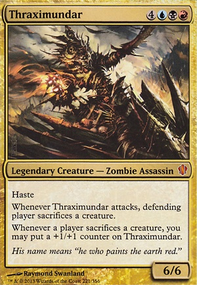 Sidisi, Undead Vizier : You'll have so many tokens kicking around to exploit that she's just a straight tutor, and if she ever hits the graveyard just use her again with Scarab God. Fleshbag Marauder : Hurts them a lot more than you, and enter the battlefield abilities are great with Scarab around. Josu Vess, Lich Knight : Solid 4/5 Menace for 4, got the extra 6 mana though and he brings friends who also have menace. Wonder : Flying zombies... yep, that's scary. Pull from Tomorrow : Nice draw on an instant with the added benefit to pitch something for Scarab to target. Price of Fame : Legendary killer + Surveil 2... love it. Sinister Sabotage : Counterspell + Surveil... love it too. Paradox Haze : You've got a couple effects that trigger on upkeep, why not double up? The deck currently seems to be going in two directions, you have a large zombie theme which I love, but you also have a minor mill theme which seems out of place. Advanced Stitchwing : Slow for what it gives, even on the bounce back it comes back tapped. Apprentice Necromancer : This is one I'm on the fence suggesting, it's a one use for one turn only. Grimgrin, Corpse-Born : This guy is beast, but he works best in a deck build around him. Lamplighter of Selhoff : Slow, for his effect. Merciless Eternal : He's not bad, just a lot better things to include in the 3 cost bracket. Phenax, God of Deception : Love this guy, really do, but he's out of place here because he's a mill guy who loves big butts. Relentless Skaabs : This guy does everything you don't want as he hurts your graveyard in order to even hit play. Servant of Tymaret : Slow with high cost. In order to make the best use of him you have to be attacking, and if the way isn't clear that means a 3 mana tax just for 1 life on each opponent. Spiteful Returned : Don't hate it, but better things out there. Stitchwing Skaab : Suffers from the same as Advanced Stitchwing. Undead Alchemist : This guy can go either way, but the way I look at him is generally people have more cards in their decks than life, so it's easier to take out their life. Vindictive Lich : This guy is fun, though for his cost there is a lot more out there. Exotic Orchard : Risky unless you know your playgroup always has one of your colors, otherwise it's just a colorless and a swamp or island would be just as good. Leechridden Swamp : Slows you down for a minor effect. Path of Ancestry : Phenax is the only other god creature, so even if you keep him in it's very slow for the benefit it probably will never get the chance to give. Coat of Arms : I love this card, I really do, but it's a calculated risk and I find zombies are usually too slow of it. Run up against a goblin or elf deck and this will do more for your opponent. Mindcrank : This is another I'm on the fence with as it pairs really well with Scarab. 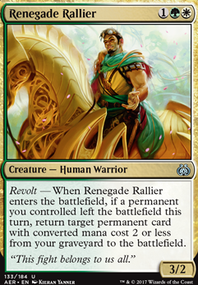 Vanquisher's Banner : Good card, though you're not casting all those tokens so you're only getting a bit of a benefit from it. Liliana Vess : Good card, out of place in this deck unless you are going heavier into the mill. Ob Nixilis Reignited : Just completely out of place for zombie tribal. Glimpse the Unthinkable : One of those mill cards, it suffers as a one of. Rise from the Grave : Expensive for effect. 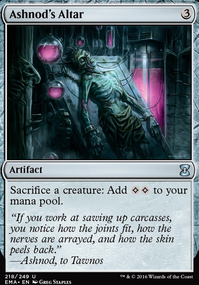 Ruthless Disposal : This isn't bad in this deck, but compared to Morbid Slip for example it lacks that added shine. Curse of Disturbance : So much politics, this is VERY meta dependent as to if players fall for the bait. Quest for the Gravelord : This can work out, but more often then not stuff isn't dying fast enough or it just gets pinged with early removal. Search for Azcanta Flip: More at home in a non-creature strategy. Torment of Scarabs : Most people can play around this with not too much fuss, and it gives all the choice to them. I'd prefer some targeted removal. 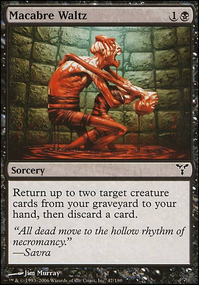 Necromancy is another solid reanimation card. Doomed Necromancer and Apprentice Necromancer are some decent reanimators-on-a-stick. Oversold Cemetery is another option worth considering, along with Hell's Caretaker . 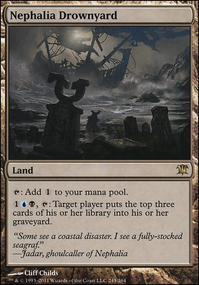 I also think you need more land sources of black mana, and should change some of your two-color lands to ones that produce along with something else. Your next heavy color is , and is close, so really focus on building your mana base accordingly. It'll help with consistency. I also think you need to reconsider the amount of copy-creature effects you are running. 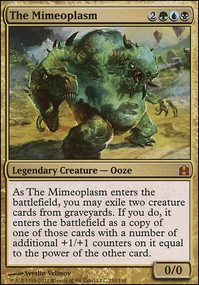 Most of your creatures here are legendary, and except for Helm of the Host , any time you copy a legendary creature, either the token or the card goes to the graveyard. Something to think about. Otherwise, I think you've got something good going here. triproberts12 on Elenda, Dusk Rose. Orzhov Vampires. Props for not going easy mode with Edgar Markov . As for suggestions, the best thing I think you could do to improve this deck is to make it more explosive. The way to do that would be to add free sacrifice outlets, along with creatures that provide you multiple bodies. For bodies, I would add Hallowed Spiritkeeper , Lightning Coils , Belfry Spirit , Promise of Bunrei , Teysa, Orzhov Scion , Sorin, Lord of Innistrad , Sorin, Solemn Visitor , and Pawn of Ulamog . For sac outlets, Viscera Seer , Indulgent Aristocrat , Bloodthrone Vampire , Bloodflow Connoisseur , Cartel Aristocrat , Blood Bairn , Vish Kal, Blood Arbiter , Vampire Aristocrat , and Yahenni, Undying Partisan are good vampire options. Sadistic Hypnotist , Dimir House Guard , Spawning Pit , Hidden Stockpile , Mind Slash are also good. What's important is that you can go off all at once. You want to sac a bunch of creatures to grow Elenda and sac her the same turn. The other challenge you'll want to keep in mind is that Elenda, the Dusk Rose must go to your graveyard to get the trigger. That means If you want to recast her, you'll have to reanimate her or exile her from your graveyard. Bojuka Bog , Relic of Progenitus , Angel of Finality , God-Pharaoh's Gift (and Gate to the Afterlife ! ), Skeletal Scrying , Rescue from the Underworld , Necromancer's Covenant , Cremate , Seance , Planar Void , Goryo's Vengeance , Postmortem Lunge , Purgatory . Despoiler of Souls , Mistmoon Griffin , Purify the Grave , Offalsnout , Coffin Purge , Drudge Spell , Cryptwailing , Treacherous Vampire , and Consecrate / Consume , Angelic Renewal , Karmic Guide , Reveillark (the prior two being an infinite loop combo), Dread Return , Nim Deathmantle (there are combos with it and Ashnod's Altar , which you also want), Palace Siege , Bloodline Necromancer , Profane Command , Unburial Rites , Faith's Reward , Ever After , Ajani, Adversary of Tyrants , Hell's Caretaker . Apprentice Necromancer , Wake the Dead , Second Sunrise , Infernal Offering , Corpse Dance , Zombify , Resurrection , No Rest for the Wicked , and Footsteps of the Goryo , are all good options. The final piece of the puzzle is making your sacrifices devastating. Dictate of Erebos , Butcher of Malakir , Grave Pact , Black Market , Harvester of Souls , Midnight Reaper , Grim Haruspex , Zulaport Cutthroat , Open the Graves , Blade of the Bloodchief , Ogre Slumlord , Athreos, God of Passage , and Dark Prophecy will help with that. Teysa Karlov could also be very good in this deck with all the death triggers. Nothing wrong with good old value creatures like Solemn Simulacrum , either. You could also use a few tribal things like Kindred Dominance , Konda's Banner , Cover of Darkness , Vampire Nocturnus , Vanquisher's Banner , Path of Ancestry , and Metallic Mimic . hkhssweiss on Warning! Extremely Graphic Content! Welcome to the fun ZagorkaForPresident! 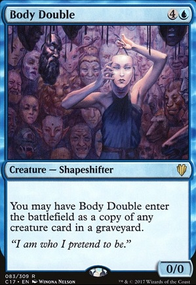 Your curve is a bit high and if you wanna abuse Kokusho you can add in a sub reanimator theme using cards like Dawn of the Dead , Dance of the Dead , Oversold Cemetery , or even Corpse Dance . 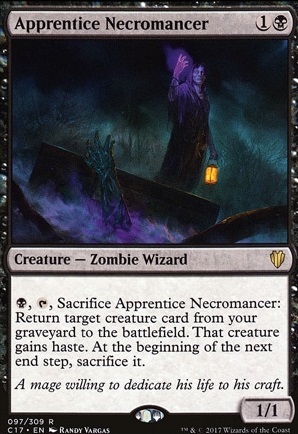 Some additional creatures that can be useful would be cards like Apprentice Necromancer or Whisper, Blood Liturgist to add in more additional effects. More sac outlets wouldn't hurt as well! Some cards to consider for outlets are like Viscera Seer , Yahenni, Undying Partisan , Altar of Dementia , or even Ashnod's Altar / Phyrexian Altar !